Wednesdays are our long days. The amount of orchestration it takes and the marathon from my morning alarm to when my head hits the pillow that night is almost funny. It starts on Tuesday night when I pack Norah’s ballet bag with her clothes and shoes for dance class. I leave it on my table and make sure to have all of Jude’s soccer gear in my car. Then Wednesday morning has me throwing food in the slow cooker at something like 7am. My mom comes to the bus stop (thank God for that) on Wednesdays to meet the kids as I’m finishing up work. She takes both of them straight to the ballet studio – where I stop on the way home to relieve her and send her on her way. Then Jude and I wait until Norah’s class is done, and he changes into soccer clothes and shin guards in the ballet studio bathroom. All three of us load in the car and drive straight to soccer practice where Norah plays on the sidelines in her dance leotard and I grade or read to prep for class. By the time we make it home, it’s something like 7pm. We eat whatever the slow cooker has ready for us, and the kids head straight up to bed soon after. It is a carefully constructed marathon with all of its moving parts and pieces. All of life can start to feel this way sometimes, no room for spontaneity. This is beginning to get a little better for me as my kids age and are more capable of embracing flexibility, but the weekdays still fly in a frenzied blur most of the time. All work, no play – for all three of us. Wednesday night when I was cleaning the kitchen while the rest of the house slept, I found an envelope Norah brought home from school weeks ago with tickets to our county fair. They did one drawing for each grade level, and she was the lucky kindergarten winner. We got rained out last Sunday when it would have been more convenient to go, but I didn’t want to lose our chance to use them. 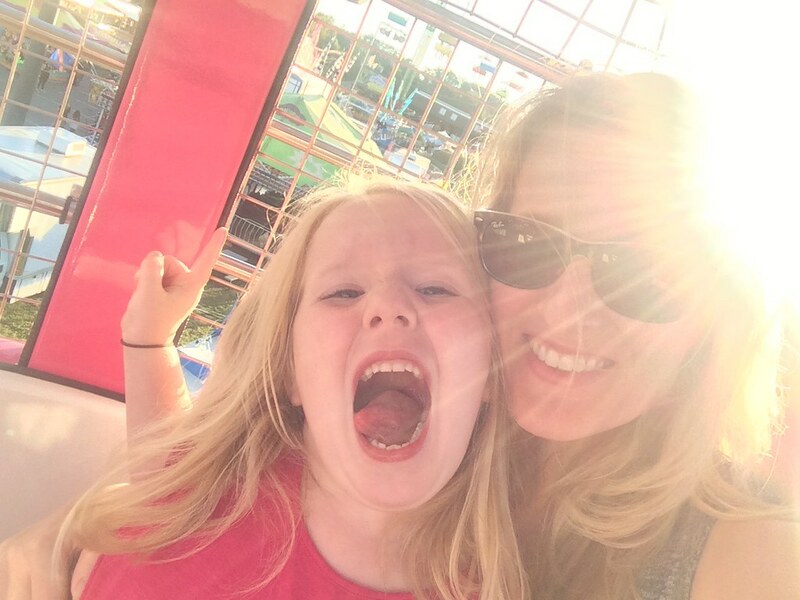 When the kids woke up on Thursday morning, I told them we were going to the fair after school, and I’ll never forget the excitement – and also the confusion – on their sleepy little faces. One of the things I am best at in life is routine, and I think they didn’t quite know what to do with my insistence that we were going to shake it up a little that night. I left work as quickly as I could on Thursday afternoon to pick them up at 4:30. We came home to decompress a minute and tend to the dog, and then we loaded the car to arrive at the fair by 6. What is it about that smell of funnel cakes and cheap nachos that takes anyone back about 20 years? We had 50 ride tickets to blow through, so we hopped on a ferris wheel soon after we walked in. Norah saw her teacher as we were standing in line and shouted her name above the crowd. She got a smile and a hug, and we boarded the ride where Jude insisted on his own seat to prove how brave he could be. Where we live is a classic example of a small town morphing into a suburb. Population growth is crazy around here, and new neighborhoods are popping up everywhere. But sometimes it still emerges with that hometown feel. Bumping into your teacher at the annual fair is one of those moments, and fall is full of so many more of them – neighborhood chili cook-offs, pumpkin patches, and fall festivals everywhere. The fair arrives for two weeks every October. There’s a small amphitheater in the center of the fairgrounds where you can find country music every night, and they’ve got local craft exhibitions here and there and a working cotton gin on display. It’s hometown Georgia at its very best. I feel lucky to center my kids in a place that feels solid and steady – planting little seeds of memories in their own minds that will bloom to nostalgia one day when they are grown. We stayed until the sun went down – my promise to them. And we left with full bellies and balloons and tiny toys they won in a carnival game. We rode the sky buckets just before we left, and they carried us high above the crowd and the lights. Poor Norah was scared, and I’m always relieved when my feet hit the ground, too. But I’m learning that it’s important to push yourself to do things you wouldn’t usually do. Sometimes that means eating a corndog for dinner and spending two hours at the county fair on a random weeknight when mom lets you stay up past your bedtime. Little things are, in fact, the big things sometimes. I am inching my way through a great book right now, but midterm madness at work leaves me with so little energy that I only turn a few pages each night before I am sound asleep. It’s Dani Shapiro’s Still Writing, and so much of what she says about the writing process can be applied to life in general, too. In the chapter where she explains the importance of detail, she insists, “I’ve learned that it isn’t easy to witness what is actually happening…But my days are made up of these moments. If I dismiss the ordinary — waiting for the special, the extreme, the extraordinary to happen — I just may miss my life.” How true that is, right? 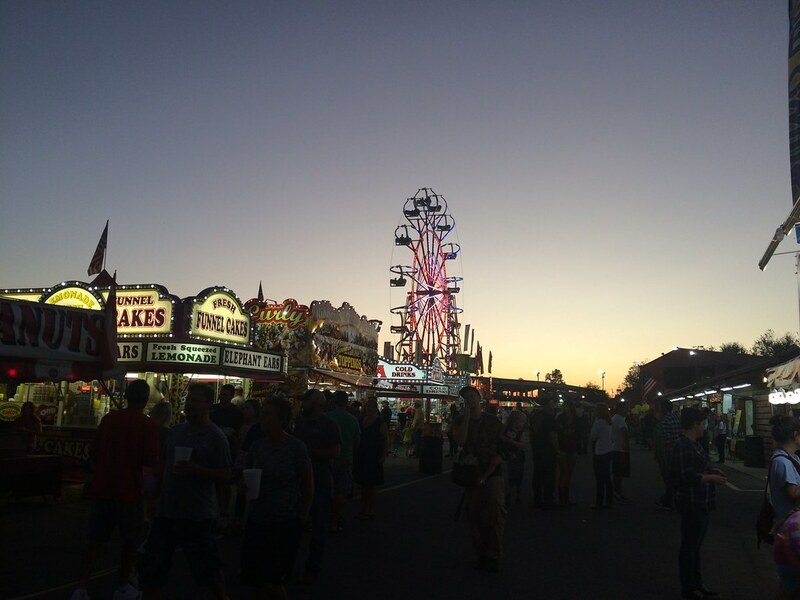 There is nothing extreme or extraordinary about funnel cakes at the county fair on a Thursday night, but I wanted to sit down to write about it this afternoon to say here I am refusing to dismiss the charm of the ordinary. I’m grateful for every little mundane second in this life I’ve got. Jude turns eight tomorrow. I can hardly believe it. Eight years of motherhood have changed me almost beyond recognition, and to be honest, even glimmers of who I was when he was a baby or a toddler seem pretty far from who I am now and from what I know to be true. This is what year eight looks like for us. We are celebrating with pizza and his choice of chocolate birthday cake and a door wide open for any neighborhood friends who want to join us. My fancy invitations this year consisted of a text message essentially saying Come on over, and tomorrow 16 of his little friends will come walking down sidewalks and across yards to sing Happy Birthday and play some backyard games. I expect that it will be like most everything else in my life lately – simplified to its most basic level so that I can actually get it done. But it will also be honest and true and real and a perfect celebration of a boy who has somehow grown to stand even with my chin and amazes me everyday with his curiosity and insight and his honest observation of everything around us. My kids may think I am the one leading the charge here, but in fact it is always them. They are the ones teaching me everyday, reminding me of what is real.